There&apos;s a reason why Hermann Maier, in his first outing after his death-defying motorcycle accident five months earlier, took to the trails on cross-country skis instead of clicking into his burly Atomics. "Nordic skiing makes you super aware of your body position, muscles, and relationship to the skis," says J.D. Downing, the national director of American Cross Country Skiers, based in Bend, Oregon. The reason: Those rail-thin skis make for more of a balancing act than fat boards. "Going from alpine to nordic is equivalent to going from riding with training wheels to pedaling a real bike," he says. Although cruising on flat land isn&apos;t what drives the Herminator, the sessions helped him regain his kinesthetic awareness-so when he put himself in gravity&apos;s hands a few days later, he was more in touch with his injured body. Swapping shaped skis for skinny skating skis doesn&apos;t just benefit your proprioception. It&apos;ll help you maintain your line on a powder day-so you won&apos;t lose the race for first tracks. Cross-country skiing, specifically skate skiing, is one of the most aerobically demanding sports going. "In cross country, you just can&apos;t get away with being lazy," says Downing. "It&apos;s a great cardiovascular workout, and it forces you to focus on things that technologically advanced alpine skis can easily do for you." To start improving your downhill skills the skinny-ski way, devote a half day to the (relative) flats of your nearest cross-country trails, and try the following drills. If you get hooked, you can also incorporate skate skiing into your alpine ski day. Just 20 minutes on skate skis after a day on alpines will help clear your legs of lactic acid, better preparing you for another up-down day. Find a moderately uphill slope-one that takes at least a minute to climb-and skate up it hard. Recover on the way down, taking extra time at the bottom to catch your breath. Start with a few reps and increase to as many as 10. There&apos;s nothing better than 2,000-foot powder runs-until you have to stop in the middle to catch your breath. "The biggest benefit from nordic skiing is the fitness level you achieve through it," says Trond Nystand, the U.S. National Team head coach. Nordic emphasizes endurance-based muscular strength, not the power of exercises like squats-so you can keep skiing all day long. Although your quads are responsible for stabilizing your knees and absorbing impact on alpine runs, jacking them up to disproportionate hulk-size will only net an injury. 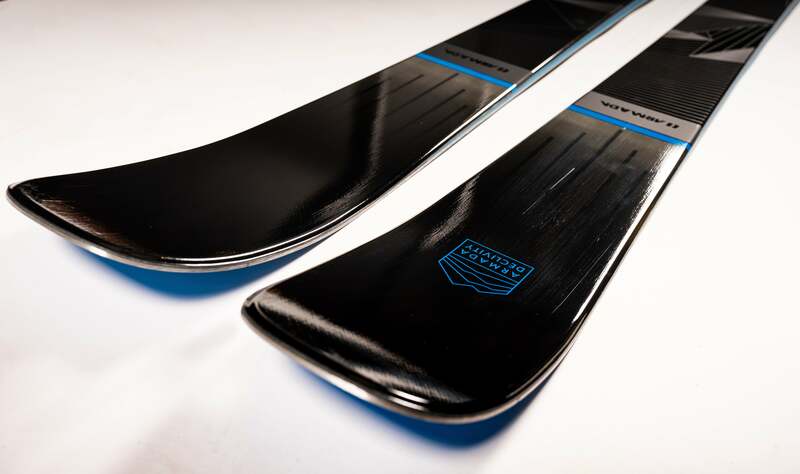 Because skate skiing constantly taxes and builds strength in your glutes, adductors, hamstrings, abs and quads, the result is a more balanced and stable, less injury-prone platform for alpine endeavors. On flat land, propel yourself by planting both poles at the same time and pushing forward without using your lower body. After you plant the poles, bend forward from the hips until your upper body is about parallel to the ground. Push hard, extending your arms behind you, straighten up, and repeat. Start with double poling for a minute, then rest a minute; repeat five times. As you get stronger and more comfortable, gradually increase the time to three minutes, with a minute rest. Increases core strength, builds a strong upper body, and gives your fried legs a break. Anybody who thinks it&apos;s just legs that matter on the slopes will be sorely mistaken-usually by the end of the morning. A strong core-your abs and lower back-is an ofteen-overlooked ingredient to an injury-free alpine career. It&apos;s not only the anchor for your arms and legs, but also the ultimate shock absorber and stabilizer for your lower half. (After a long bump run, chances are your lower back is feeling it.) Your core is essential for good balance, and it allows you to pull off recovery moves (think Bode Miller). How to do it: Leave your poles at the lodge, and spend a session concentrating solely on your skating, body position, and rhythm. To avoid feeling clumsy and wobbly, assume an athletic stance: Bend at the knees and the ankles, keep your spine relatively straight and your toes, knees, and hips in a straight line. What it does: Forces you to focus on your equilibrium, and doesn&apos;t allow you to salvage a sloppy style with your upper half. Why it matters: "It&apos;s very easy to rely on alpine equipment for balance," says Chuck Kenlan, head of the nordic skiing center at Mount Bachelor. "But all the balance in nordic skiing comes from inside." Instead of letting gravity and equipment do the work, cross-country skiers have to glide smoothly on one ski-on a surface no wider than a human foot. Your alpine stance is different than one you use while skate skiing, but the kinesthetic sense you&apos;ll develop will help you take the mountain more smoothly and aggressively.